A histogram is a statistic measure that calculates the occurrence of a variable. Write two programs that read a file and display a histogram to show the occurrences of each letter in the file. 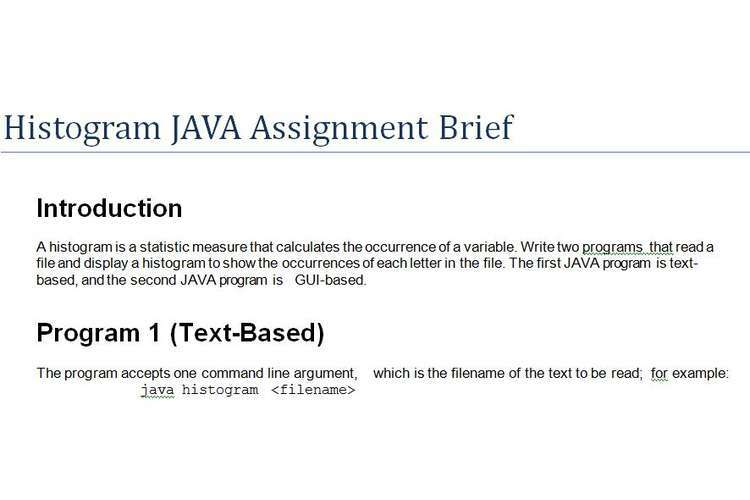 The first JAVA program is text­ based, and the second JAVA program is GUI­based. the total number of characters counted (only include A­Z)? the letters in upper case? a series of asterisks showing the percentage of each occurrence. The program outputs a vertical bar for every 10 asterisks. The letter with the largest occurrence should have 50 asterisks and the number of asterisks for the rest of the letters should be proportionally scaled to the letter with the highest count. The next section explains how to calculate the number of asterisks to be displayed. The letter E has the highest occurrence with a count of 1,000 and it makes up 18.04% of the characters, so it has 50 asterisks. The letter ‘A’ makes up 5.41% of the characters, and has 15 asterisks because 5.41/18.04*50 = 15. The program should round the number of asterisks down to the nearest integer value. develop a text­based and a GUI­based Java programming. to write test cases using JUnit. be able to design and construct Java Graphical User Interfaces (GUI) that interact with problem domain objects? be able to construct and demonstrate the use of reusable software elements utilising JavaBeans? be able to demonstrate the use of the inheritance features of the Java language to design and implement complex object­oriented programs.